The Straight Shooter, the Moonwalker, and the Jumping Bean. These writers are like Jon Lovett: straight shooters widely respected on both sides. They begin at the beginning and end at the end, always writing in sequential or chronological order. Chapter One is completed, then Chapter Two, then Chapter Three, and so on. Whether drafting or editing, they stick to the story exactly as it’s meant to be told. Pros of the Straight Shooter: These writers tend to be well organized, and working in strict sequential order keeps them in the headspace of their story. They get a good feel for how the plot naturally unfolds, traveling with it each step of the way. Cons of the Straight Shooter: If Chapter Seven is giving the Straight Shooter trouble, it can be very difficult for them to move onto Chapter Eight. (A funny, nagging feeling starts plucking at their brain, oftentimes somewhere behind the right eyeball, and it can be obnoxiously difficult to get rid of–the only known remedy is to cave and go back to Chapter Seven.) 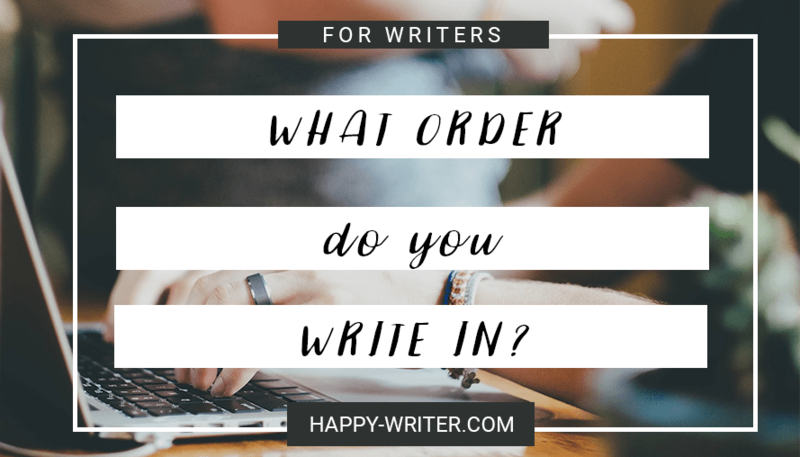 They might feel the need to have every chapter in order before they’re “allowed” to move onto the next, and sometimes this can cause major stalls in the writing process. Next we have the Moonwalker. These writers slide through their story back to front, preferring to perfect their ending first before tackling the rest of the book. Pros of the Moonwalker: Working backwards is a great editing technique, as solidifying your ending can help you keep your plot focused and your editing on track. Looking at their stories backwards can give Moonwalkers a unique perspective; they might find their backwards approach makes it easier to add foreshadowing and lay down clues in earlier chapters. Cons of the Moonwalker: Reverse Engineering a plot can have its downsides–working entirely from back to front can risk muddling your momentum, and it can be difficult to fight the urge to add too many cheeky winks, thus telegraphing the ending. Ahh, the writers after my own heart. I am, I confess, a Jumping Bean. We Jumping Beans are chronically incapable of sticking to a set sequence, preferring to jump and twist and twirl around our stories, writing whatever scene or chapter feels right on any particular day. Pros of the Jumping Bean: Jumping Beans tend to be immersed and passionate about the scene they’re writing–otherwise, they would be working on a different one! Cons of the Jumping Bean: It’s easy to get overwhelmed by a story if you’re constantly leapfrogging from one chapter to another without a set plan–and very easy to go off on diversions or create inconsistencies with your style or voice. Jumping Beans can often feel frustrated or discouraged that their plots aren’t quite coming together. The story can seem disjointed, like a Frankenstein’s Monster of disparate parts patched together, a problem that tends not to plague stories written in stricter sequential order. So, how can a Straight Shooter getting bored with their story spice up their writing life? How can a dizzy Moonwalker regain their momentum? And how can a Jumping Bean wrangle their disjointed plot back in order? I’d say, by borrowing from the working features of the other traits and keeping mindful of each method’s unique faults. Straight Shooters should remember to follow their passions. If a chapter isn’t working right now, they should try not to feel guilty for setting it aside to leapfrog to a different point in the story, at least for right now. There’s no rule saying you have to write your story in order, and it’s far more beneficial to get the whole story down than trying and trying and trying to perfect each chapter before you move onto the next. Moonwalkers who feel their story lacks momentum could benefit from writing it over at least once from beginning to end, to make sure the style is consistent and the story builds sequentially. And Jumping Beans who feel their plot isn’t coming together should consider jumping on over to their ending to solidify it first like the Moonwalkers, and then creating a sequential outline for their edits in true Straight Shooter fashion. In truth, there’s no right or wrong way to write a novel, and most writers will probably write with a combination of these traits. Maybe you’re a Straight Shooter for your first draft, writing from beginning to end, but when it comes to editing, you Moonwalk backwards through your revisions. Or maybe you leapfrog around for your first draft, then edit in a straight line from Once Upon A Time to They Lived Happily Ever After. However you choose to tackle your story, the important thing is to finish it, no matter the (at times twisty and turny) road you take to get there. What sequence do you tend to write in, my lovely happy writers? Are you a Straight Shooter for your first draft and then a Jumping editor? Or is your method different still from these three? Maybe you start in the middle and branch outwards–what should we call you? A sprouting tree? Leave a comment below, and tell me how you tackle your writing projects! Be sure to share this post through the icons below so all your friends can figure out if they’re a Moon or a Bean, and follow this blog either on BlogLovin or by putting your email in the gray box at the top of the sidebar, for writing tips, tricks, and advice delivered to your inbox every Monday. Resist. Persist. Write Like a Decent Human Being.